Athletic footwear as daywear is a trend that is on the rise, and more options are appearing that can blur the line between a trainer strictly for working out in, and one that can double as a cute weekend shoe option. When Millet Sports invited me to style a pair of running shoes, it was the color which drew me to this pair of Adidas Adios Boost trainers, but the super cushioned 'boost' sole, offering plenty of support and comfort, combined with the lightness of the shoe, which makes for a pair of very happy feet. Trainers can be stylish and fun, and the fact that these were mint green made them the perfect choice to wear to the St. Patrick's Day Parade. Even thought it was freezing cold and windy, (guilty of dressing for the weather I want more than the weather that is) not having to worry about my feet becoming achy or fatigued while we stood watching the parade for over an hour was a blessing. And when it came time for the ten minute walk back to the car, I could have practically sprinted. Millet Sports provided me with these shoes for the purpose of this post. My views and opinions are my own. Love love those sneakers!! The color is perfect. I love the casual trend and definitely need to invest in some new sneakers!! CUTE! I love the color of your sneakers! Those sneakers are so cute - this just reminds me how much I love mint! Those kicks are so cute. And I love how low profile they are. The mint color is unique as well. So different from your usual heels. Woohoo for comfy and stylish shoes!! Such a great outfit for the parade! 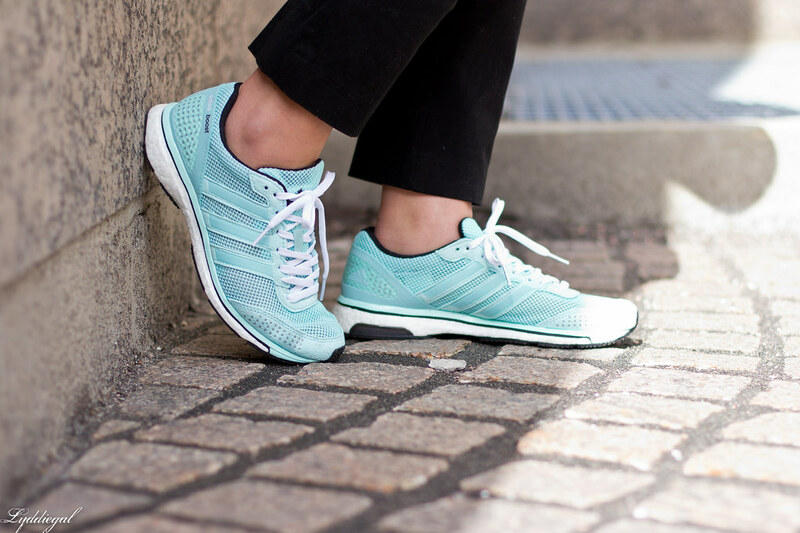 Love the mint color sneakers, you look comfy and chic! Amazing! I am doing sneakers on my blog this week also. As new again mom I am super psyched that they are a thing now. 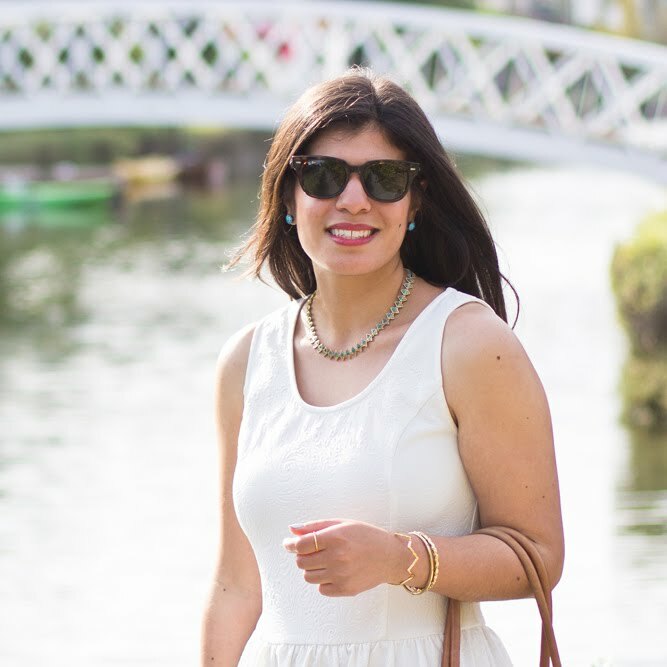 I love your mint ones and in fact your whole outfit is quite inspirational! 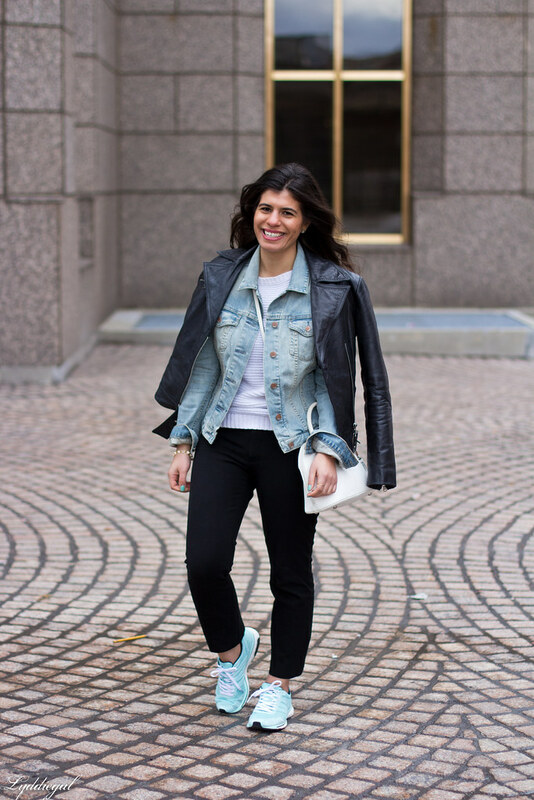 I do love the sporty chic look and those mint sneaks are too fun! I am loving this sporty look! Those shoes are such a fun color! You style a sporty look very chic! Love the mint sneakers! Love the color of the sneakers! I'm also really loving that bag! Love these shoes. The color is them is my fave!! They look adorable! I have yet to full embrace the trainers trend, but I have to say you tempt me more every time you wear them. 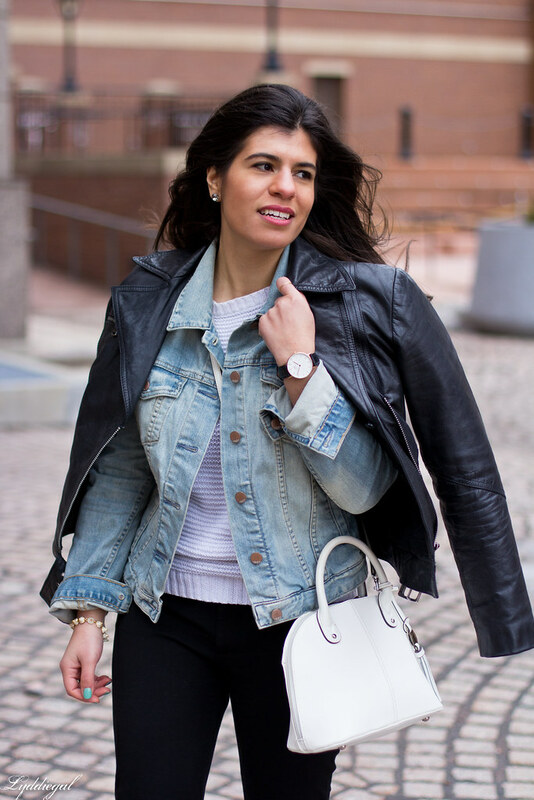 But the part of this look I really love is the layering of your sweater, denim jacket and leather jacket - I would never have thought of wearing two jackets together this way but I absolutely love the results! 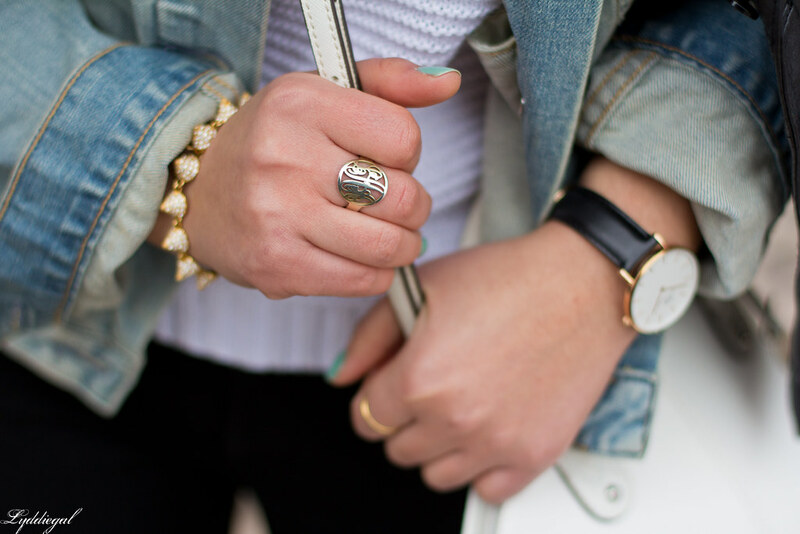 Nothing better than denim jacket on spring. But it can get better with trainers like yours and leather thrown on your shoulders. So relaxed! Very cute! I love the color a lot. I just bought a new pair for running and chose a bright pinky-orange. They are sooooo cute, I love sneakers. I love these sneakers, mint is such a great color for spring! 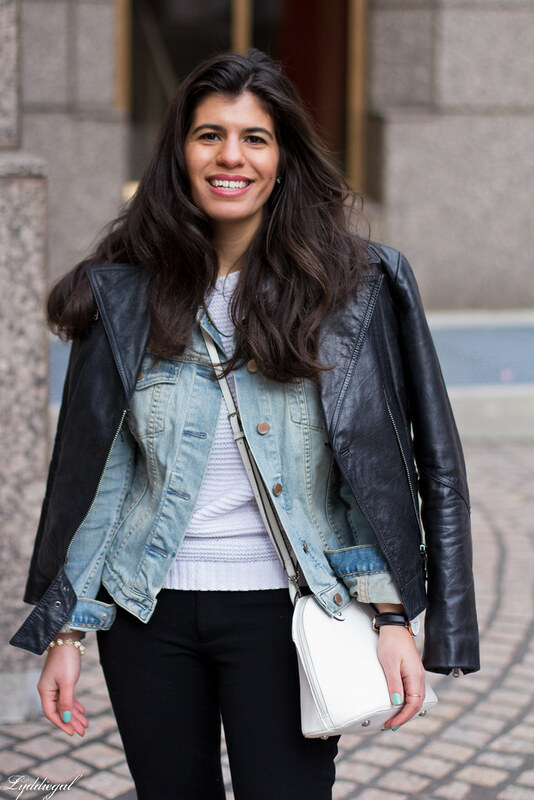 I love your layered look! The shoes are adorable. I love shoes that are pretty colors. Those trainers look amazing!! love the color!! Those shoes are adorable! I love the fun color! And your layers are looking fantastic too! This is such a cute, sporty look! Those trainers are a gorgeous color! 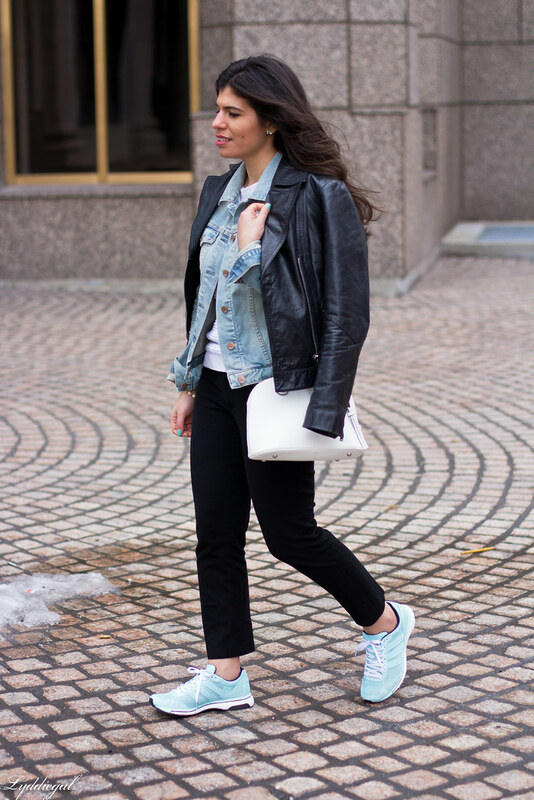 Those sneakers are the perfect color to transition to spring--I love the casual vibe they give this look. And dressing for the weather you want...I love it. I do that sometimes too! I'm currently in dire need of new trainers and I love that you chose a fashionable pair! Those sneakers are the prettiest color! Great styling with the trainers! The sporty chic is definitely a trend that I still want to try! 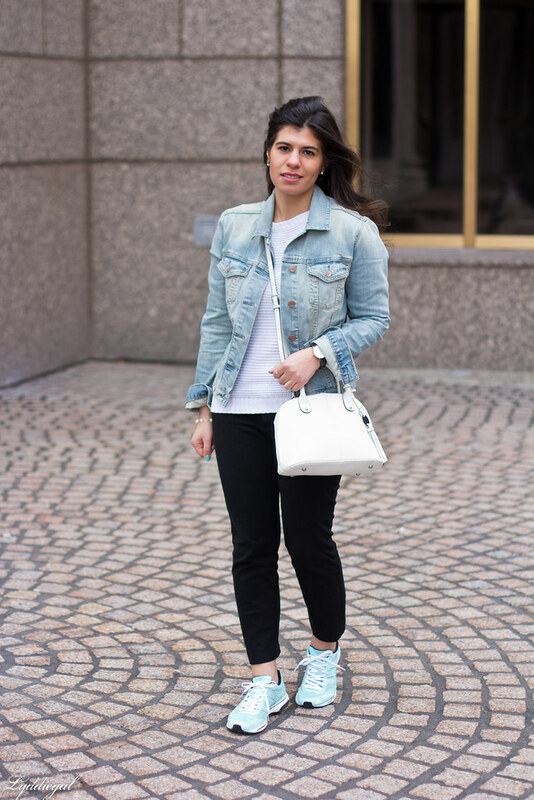 Those mint sneakers are absolutely adorable, and I love the pop of white from your bag! I love how sneakers are being put with outfits that sleek flats would have gone with. You styled this so well! Your layered jackets are so cool. You look fabulous! 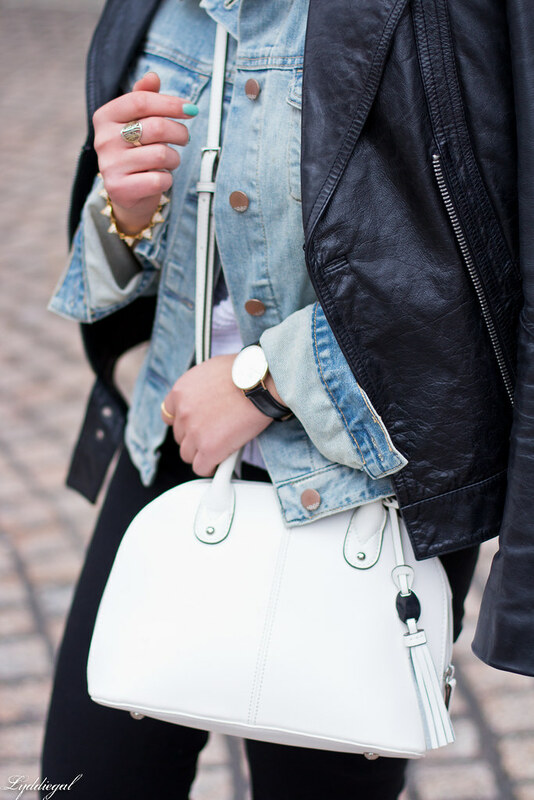 Loving the leather layered with the Denim! And those mint shoes are to die for! So cute! SO cool. I love the color you chose- mint is so fresh! What a FUN and wearable color! I have a feeling you'll be rocking those for a while! I know its a trend creeping up..- but I relate sneakers not only to sports but also to tourists! I always ask myself why are tourists usually so badly put together ? Dont you want to look nice in the pictures you take ? SPend $$ on the trip but look like a bum when you see your pictures of Egypt ?… ignore me - I just saw a couple of tourists and just don't get it. You have so many cute sneakers Lydia. I love how you layered the 2 jackets together. They look great and keep you warm. I must try.